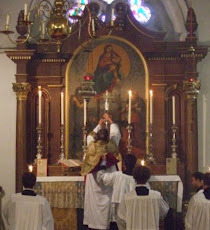 Fr Hunwicke's Mutual Enrichment: Ecce Agnus Dei; Ecce. Fr.May i wish you a happy and a Holy Christmas! Wonderful. Thank you, Father. Wishing you a very peaceful and happy Christmas. Thank you for such an inspiring quote. A Blessed Christmastide to you & yours. Dear Fr. Hunwicke, your post has cheered me immensely. Please pray for me and my little family. I ask great blessings for yours.